This 14k white gold amethyst and diamond ring is a real beauty! 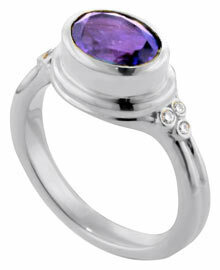 The oval center stone is a 9x7mm AAA quality genuine purple amethyst. The 6 - .011 carat round diamond side stones are all G-H in color, and have a clarity of SI. Total carat weight of the amethyst and diamonds is 1.56 carats.